The Synod on the Family has seen many observers and participants expressing almost daily frustration over the apparent confusion in, or “confusing signals” being sent by: the synod as a whole, the freewheeling media conferences and even the very process. One small group called the "Instrumentum Laboris," that is, the working document, "chaotic." 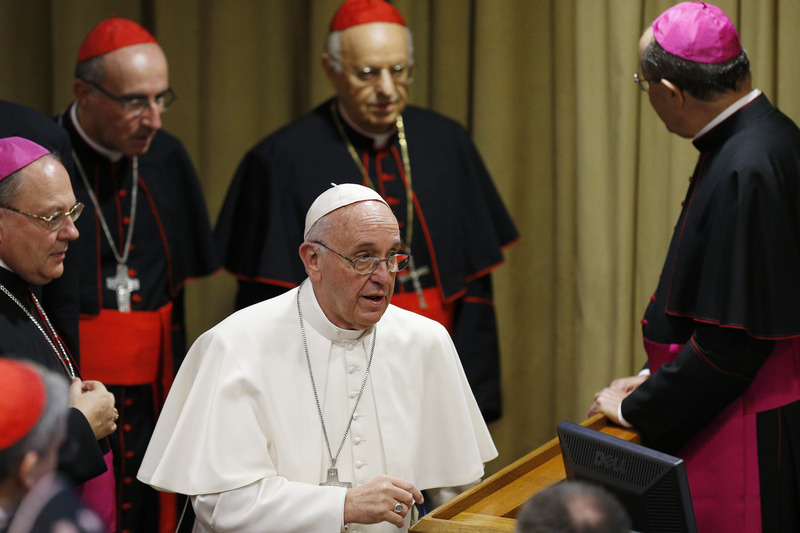 Other small groups expressed a more general fear about "confusion" at the synod. Last year, Archbishop Charles Chaput of Philadelphia said that he feared that any “confusion” that might come from the synod, and how it is perceived, is “of the devil.” Stakes are even higher now that some have hinted that Pope Francis would not produce an “apostolic exhortation,” which often smooths over differences, but rather that the synod’s final report may be the last word on the recent deliberations on important issues in the church. As with many aspects of Pope Francis’ leadership, his approach to the synod may best be understood through his background as a Jesuit. For example, his initial selection of a group of nine advisers, the so-called “G-9,” which surprised most Vaticanologists, who wondered why the pope wouldn’t rely on the heads of major congregations, made perfect sense to Jesuits. They grasped that Jorge Mario Bergoglio, S.J., was simply doing what every Jesuit provincial does: selecting a group of “consultors” from outside the normal chains of command to advise him. Here, while the pope’s approach to the synod is familiar to Jesuits and their colleagues, it may be unfamiliar to participants and observers. It is called group discernment, or communal discernment, and it is by its very nature is messy, confusing and even chaotic. Discernment is the overall term used by Jesuits and their colleagues to describe the way that decisions are made in a prayerful way. St. Ignatius Loyola, the Jesuit founder, lays out many of these methods in his classic text The Spiritual Exercises. At heart, the process begins with the belief that God wants a person, or a group, to make good, healthy and life-giving decisions; and through the “discernment of spirits,” that is, sorting out what is coming from God and what is not, one gains clarity into the best path. God therefore both wants and enables individuals and groups to arrive at good decisions. Group discernment is the discernment process when it involves two or more people. But some of the elements of group discernment, which can be complicated and even counterintuitive, may be unfamiliar for participants in the synod, as well as for many observers and commentators. This is not only because previous synods were more restricted in their ability to discuss topics as openly, but that certain elements of group discernment are challenging even for those who have had long experience with the process. Group discernment requires the following of all the participants. 1.) Freedom. At the heart of every group discernment is the idea that everyone should be “indifferent,” that is, radically free to follow God’s will wherever it may lead. Of course, as St. Ignatius indicates in the Exercises, prior commitments and fidelity to church teachings are essential, but one cannot be “attached” to anything that would prevent the Spirit of God from moving freely through the group. St. Ignatius speaks of “disordered attachments,” fealty to things, ideas and people (likewise, to status and reputation) that prevents one from thinking, speaking and acting freely. The most essential element of group discernment is this absolutely radical freedom. This may create tension among those who feel that any movement away from the status quo is in opposition to fidelity to the church or that change itself would cause confusion. That is, some may feel that attachments not only to church teaching but also to the status quo are valuable. In group discernment, by contrast, unnecessary attachments are to be released. Freedom is paramount. 2.) Complete openness. This was hinted at by the pope’s speech to the first session, in 2014, in which he encouraged parrhesia, a bold openness and freedom of speech. “Let no one say, ‘This you cannot say,” he told the assembled bishops. The key idea is that the Spirit is at work in the sometimes confusing and chaotic discussions and, more importantly, through every participant. Group discernment calls for a willingness to be open with one’s thoughts and feelings, and also to be open to another person's thoughts and feelings, no matter how threatening they may seem. Moreover, in a group discernment it may be the least likely person or group through whom the Spirit moves most strongly. This may be in tension with those who feel that those with the most authority, learning or experience naturally have the correct “answer.” (In fact, in group discernment the “answer” is the goal not the starting point.) It may also be in tension with the fear of being open out of worry that someone may consider a person on the “wrong” side of things. Finally, it may be in tension with a kind of “groupthink” that prevents a person from expressing an opinion at odds with the majority of the group. 3.) Patience. The Spirit blows where it will. It takes its time for people to offer their reflections, for questions, for discussion, for clarifications, for prayer and for discernment. The Holy Spirit cannot be rushed. So it may take days for a decision that was expected to take hours, and weeks for a decision that was expected in a day. This may be in tension with the timetable imposed naturally on a group of busy participants. 4.) Significant time for prayer. An essential element of group discernment is group prayer, but also private prayer--and large blocks of it. And following that, for discussions with the group about what has occurred in one's prayer (as each feels comfortable). Group discernment means bringing before God what one feels about the discussions of the day, examining carefully what lingering resistance there may be in hearing another person’s opinions, being willing to share the fruits of prayer honestly, and also asking God for help. All this takes time. Again, this may be in tension with the timetable imposed on a busy group, as well as perhaps a fear of openness about one’s personal prayer. 5.) Confirmation. After a decision has been made by the group, St. Ignatius expects the participants involved to feel a feeling of what he calls “confirmation,” a sense of peace or rightness. Confirmation is notoriously difficult to define. But it is an essential part of the process. It is not relief that a process is over, much less elation that your side has “won.” You aren’t happy with the decision simply because your argument has carried the day, or even because you are content that everyone seems pleased with the outcome. Rather, after all the voices have been heard, and true clarity that has emerged, you experience a confirming peace that is itself a gift from God. It is, if you will, God's "indication" that the group is on the right path. One feels in concord with God's desires because one is in concord with God's desires. As I said, Ignatius expected confirmation of a decision. This especially subtle aspect of discernment is not so much in tension with any aspect of the synod, but may simply be unfamiliar to the participants. As I listen to the participants and observers who seem to fear "confusion" and "chaos," I hear a natural fear of what many Jesuits are used to doing. But, as I said, it’s natural. Even for Jesuits group discernment is difficult and frustrating: for it requires freedom, openness, patience, time for prayer and an understanding of confirmation. But in my estimation, unless the participants are invited to see the synod as a form of a group discernment, there will continue to be a clash of cultures, and frustration on all sides. Thank you for the explanation of Group Discernment. I am reminded of a quotation from Brian Friel's play "Translations": "Confusion is not an ignoble condition"
Years ago, the orientation group of which I was a part became overwhelmed by the tsunami of information that broke over us as we began our PhD journeys. "Embrace the confusion! ", said our professor. None of us had any idea what that meant. We learned! By letting go and allowing ourselves to risk being drowned, we learned how to stay afloat. There's a lot to be said for confusion. I love that... "Embrace the confusion!" This method of group discernment would be good for Congress as well! Taking time for prayer or reflection might help consensus building. Thank you for explaining the synod process so well. St. Ignatius what a guy..... I was wondering if an exorcism would have been a good idea! Surely, it would help free up the synod members minds i.e. preventing negative or evil thoughts, etc. thus give the Holy Spirit better access....just wondering.